♥ This invitation can be customized to match the colors of your event. Please ask for more details and available color options. DIMENSIONS = 5" x 7.25"
****For orders over 100 pcs please ask for a custom listing to be set up for you. ***Discounts are available for orders of 200 pcs or more. Please ask for details. If you would like to see a sample before ordering, please select the SAMPLE option from the drop-down menu. All Samples are $10.00 each plus shipping and come with the RSVP card and envelopes. 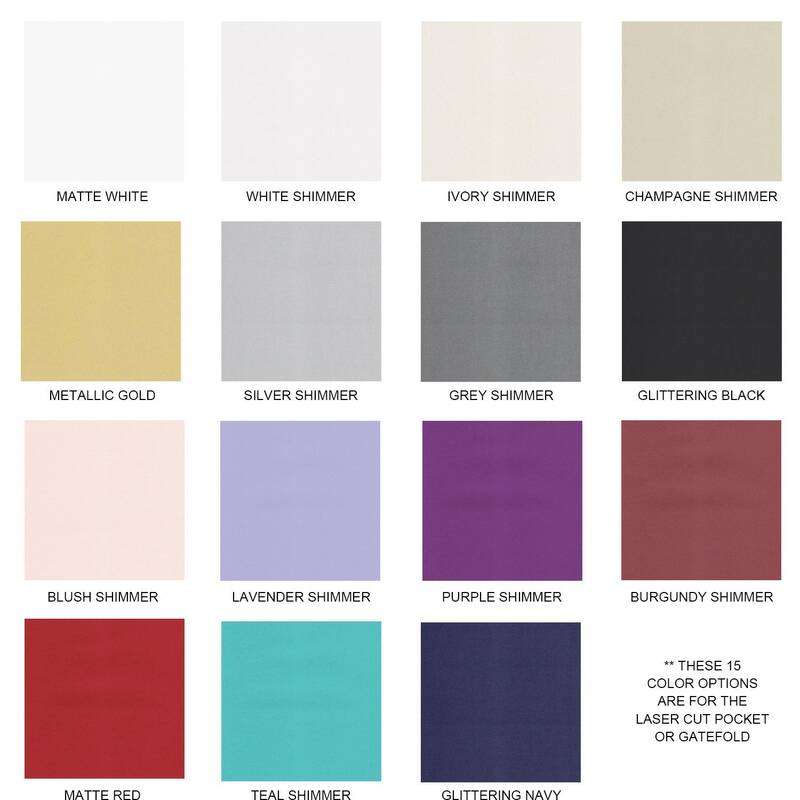 Please note that you cannot customize the colors, wording, or fonts for samples, however you may request alternative color swatches. Samples are shipped out within 2 weeks or sooner. 1- Date you need these delivered to you by. Please keep in mind that normal processing time is 4-6 weeks. If needed sooner please inquire about rush order availability BEFORE placing your order. Additional RUSH fees will apply. 2- Your email address so we can send you our wording form. Proofs will be emailed to you for approval before final printing and production of your order. 3- Any color changes to the papers, envelopes, or embellishments. If no color changes are requested, you will receive the exact same colors as in the photos. Color Charts can be seen in the GALLERY page. If you would like to add envelope addressing to your order, please contact us so we can send you a separate invoice for this service. You will be notified when your order ships. All orders are shipped via USPS priority mail. Shipping costs will depend on location and quantity/weight of order. 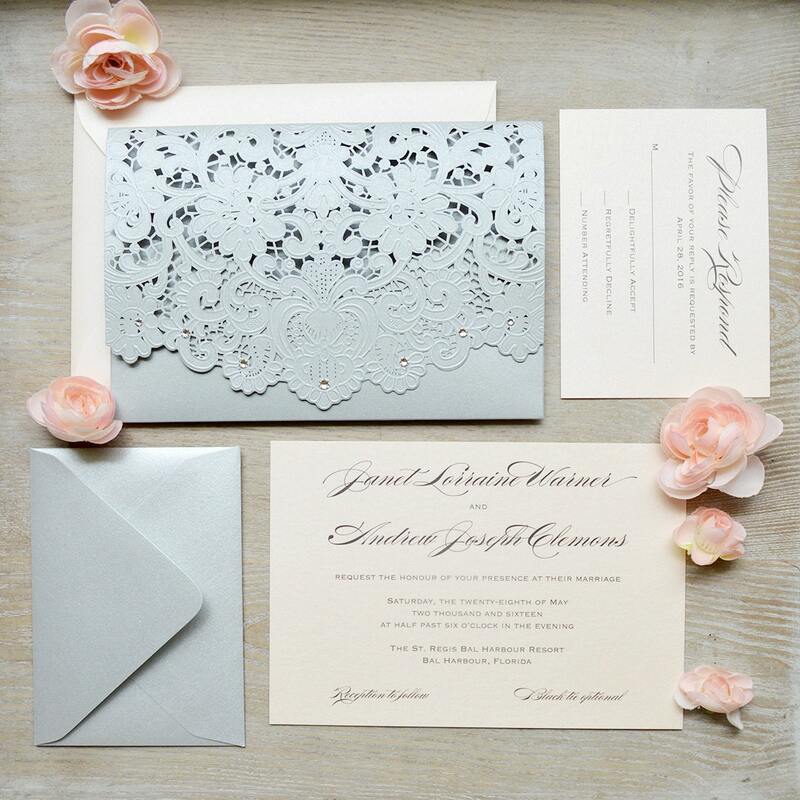 Please note that embellished invitations should be "hand-canceled" and may require additional postage. We encourage that you check with your local post office before purchasing stamps and mailing your invitations. *For more shipping information and store policies please click on the Shipping & Policies tab above. Samples are shipped within 7-10 business days (M-F) of your purchase via USPS First Class Mail. Delivery in 1-3 business days within the US. The shipping cost is calculated based on the destination, quantity and weight of the final package. Insurance and Signature confirmation is required for orders over $250 or upon request. All domestic bulk orders are shipped via USPS Priority Mail which takes 2-3 business days in the US. Express mail and overnight options are available upon request. We offer 2 options for International Shipping. Priority Mail International (6-10 Business Days) or Priority Mail Express International (3-5 Business Days). Please also be aware that this time frame does not include time that can be spent in customs. We are not responsible for any shipping delays due to customs. Depending on the country, a package can stay in customs for several weeks or more. Please look into your countries customs policies and information before placing your order. Some countries charge additional tax and duties for international shipments. As the buyer, you are responsible for these additional fees and any other charges your country may make. **PAPER & LACE is not responsible for any shipping delays due to weather related conditions. We are also not responsible for any lost or stolen packages after delivery has been made. Custom printed stationery is not returnable. This is because custom printed items are created on a per order basis and cannot be resold. 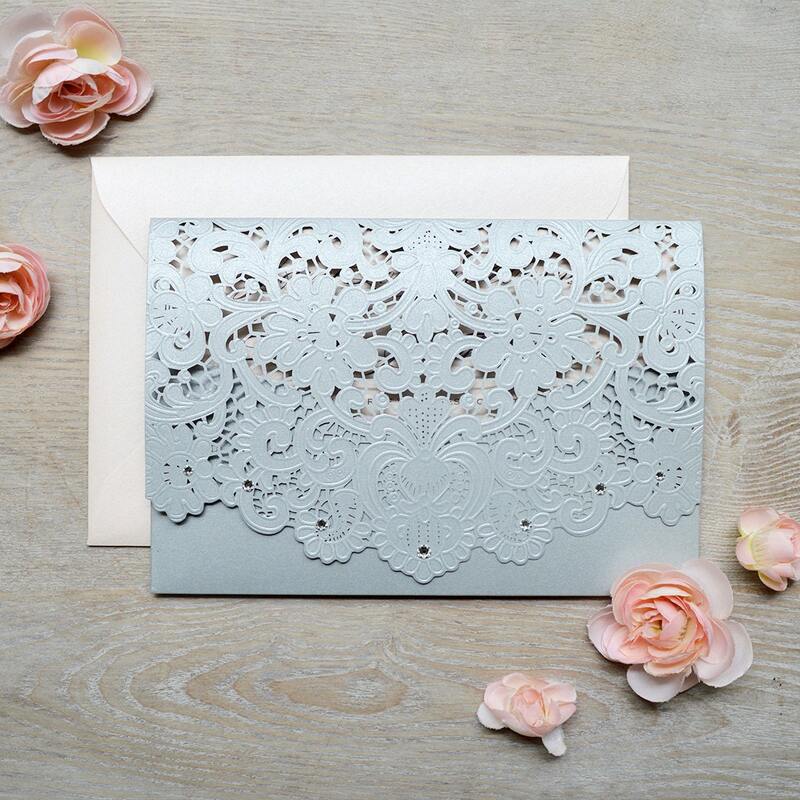 Custom printed stationery includes invitations, enclosures, envelopes, liners, invitation wraps, programs, menus, thank you cards, place cards, table numbers and save the dates. We are confident that you will be satisfied and happy with your customized order. To ensure 100% satisfaction, please be sure to review your proof(s) for misspellings, grammatical and punctuation errors. We are not responsible for any errors once the final proof approval has been submitted. Please triple check all spelling, grammar, capitalization. We highly encourage that you send an emailed proof to a family member or friend for viewing. We make an effort to carefully check and proof all orders before they are shipped. However, if an error is made on our part we sincerely apologize and will make all efforts to resolve the problem as quickly as possible. Our design team works closely with you to achieve the custom design that is perfect for you and your event. We customize to your colors, paper choice, wording, fonts, and embellishments for superior satisfaction on your final product. Your order also includes THREE complimentary rounds of digital PDF proofs which will be sent to the email you provide. All additional proof requests are subject to a $25 design fee due to the extra design time involved. 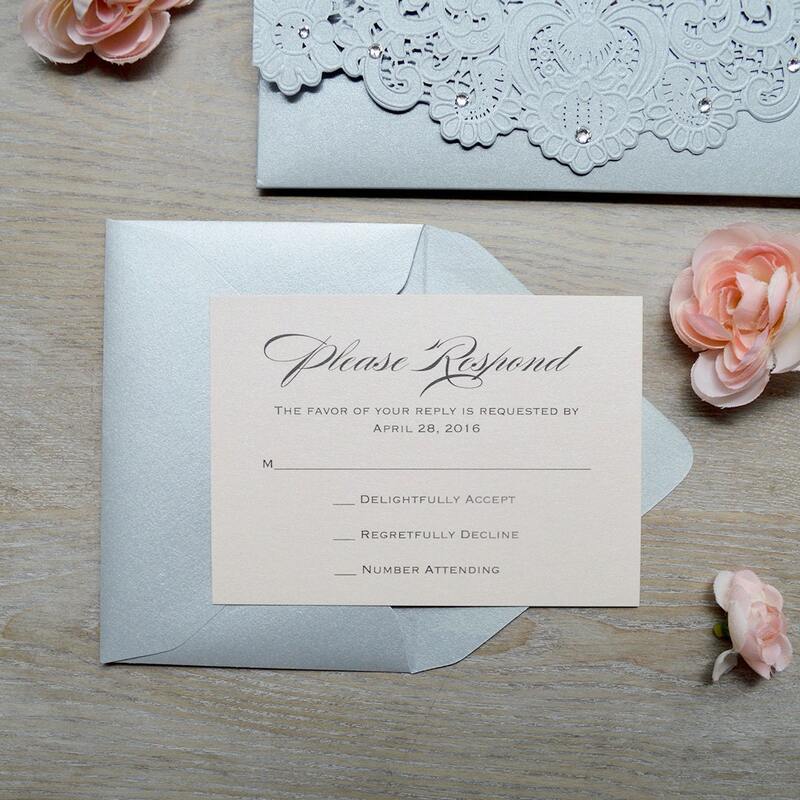 We highly suggest ordering at least 10% more invitations than you think you will need. 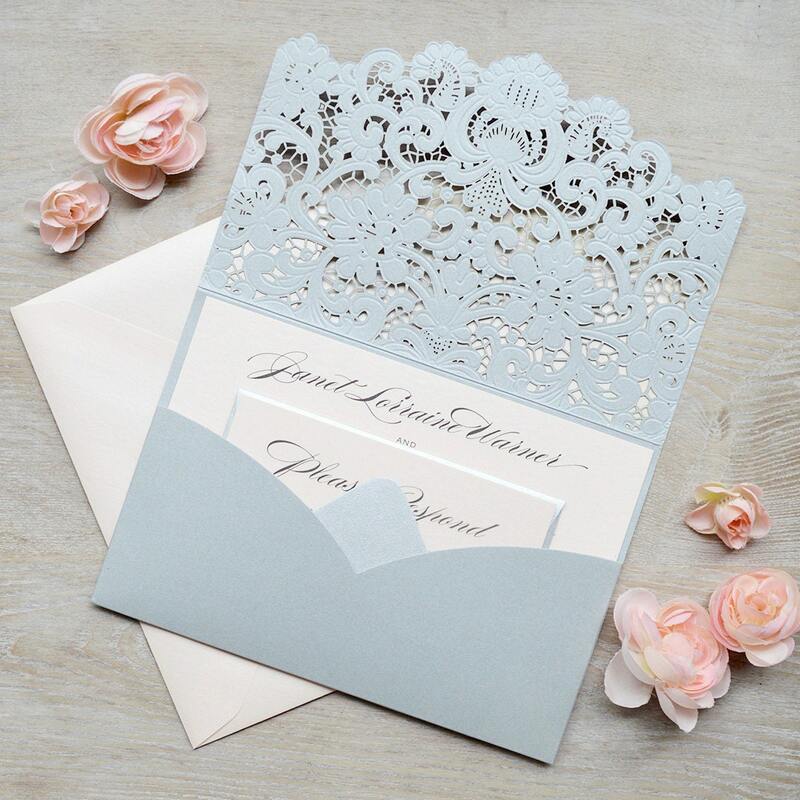 If you decide you need additional invitations once your order is complete, you will need to order the minimum qty or pay a $25-$50 flat rate fee in addition to the price per invitation. All computer monitors and printers are color calibrated differently. Colors may vary slightly from that seen on the screen and paper type and colors may also affect printed colors. It is not possible to guarantee the image you see is an accurate representation of how it will look once printed.